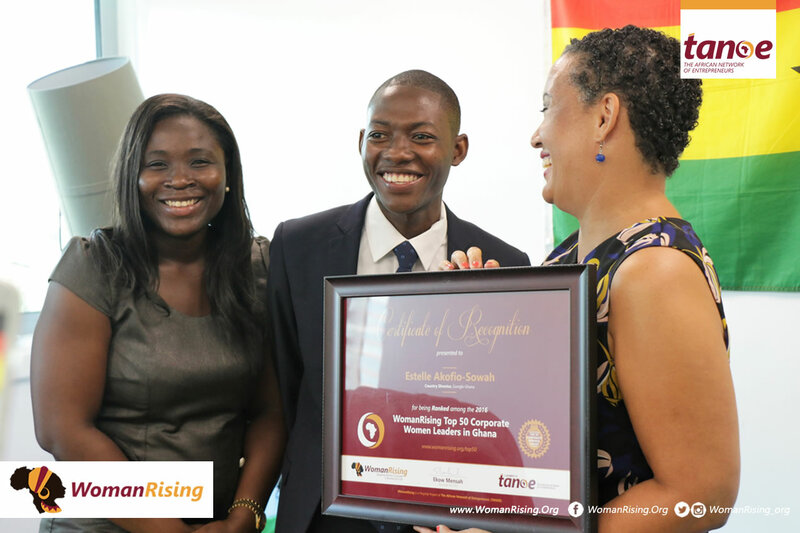 In its pursuit of recognizing women business leaders in Ghana, WomanRising, a flagship network of The African Network of Entrepreneurs, presents an award to Estelle Akofio-Sowah, Country Manager of Google Ghana as a recognition for being listed among 2016’s Top 50 Corporate Women Leaders in Ghana. The ranking which was instituted in 2016 by WomanRising, was aimed at highlighting the achievements of women business leaders in the country and echoing the important roles they play in various institutions which are key to the country’s economy and job creation sector. 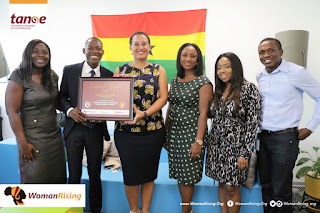 In a private ceremony hosted at the head office of Google Ghana, with her team members present, Ms Estelle was presented the award by the COO of The African Network of Entrepreneurs (TANOE), Alice Larkai and head of Research, Prince Akpah. Before her appointment as Google Ghana Country Manager in 2009, Estelle served as Managing Director of BusyInternet and was the President of the Ghana Internet Service Providers Association. Others recognized on the list include: Lucy Quist (CEO of Airtel), Roshi Motman (CEO of Tigo Ghana), Mawuena Trebah (former CEO of GIPC), Abiola Bawuah (UBA Ghana), Angela Kyerematen-Jimoh (CEO of IBM Ghana), Christiana Olaoye (CEO of Energy Bank), Yolanda Zoleka Cuba (CEO of Vodafone Ghana) and now Estelle Akofio-Sowah (CEO, Google Ghana). WomanRising is a network under The African Network of Entrepreneurs (TANOE) that focuses on women entrepreneurs and professionals in the consistent development and advancement of women, especially in Africa.